Mens Red Chapter Clothing Ambigram shirt in the Breathe Music design in black with blue detailing. The tattoo art style Rock n Roll Music Lovers Ambigram reads as Breathe in one direction and as Music in the other. This shirt is in a Black Mineral Wash color and is very soft from specialty treatment washes and is accented with Blue printing. The background art work features Winged Guitars, Old School Microphones and Music Notes. There is no foiling on this shirt making it perfect for guys that like ambigram shirts but do not want the shiny bling from the earlier versions of this shirt. 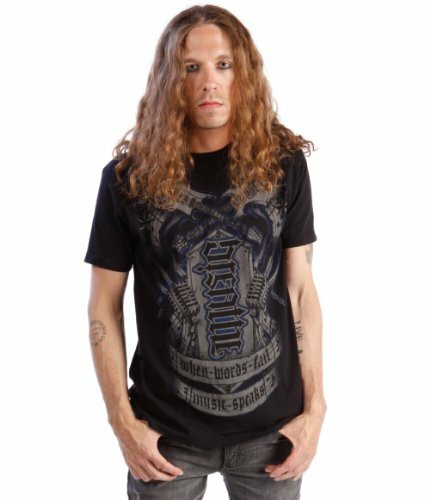 This is the perfect shirt for any Musician, Rocker or Music Lover. It is the perfect musician shirt as to a true musician Music is just as important as the air they Breathe.